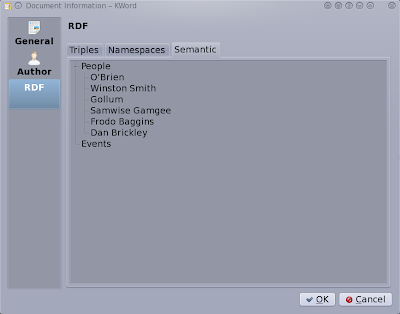 I've been hacking on the development branch of KOffice to add RDF support. Thanks to KO GmbH for this chance! This means that while a document can posit a linear progression of characters and words like normal, the software can start to understand a bit of what you are talking about too. The ODF document specification allows RDF to be included in the document zip file either inline in the main content.xml file, or using manifest.rdf and other RDF/XML files in the zip. The RDF is free to refer to XML elements in the content.xml, so you can add metadata to names, places, times etc so that a computer can work out unambiguously what you are talking about. This makes an ODF file a very powerful container format for transmitting meaning to people. If on the other hand, you are not a developer and/or don't really care about triples or RDF, there is the Semantic view. Right now I only have support for Contact information which is drawn from the FOAF RDF vocabulary. If the later doesn't mean anything to you, its just a way to describe people and their relationships using RDF. As you can see, you don't have to care about RDF here, you just see people. Right clicking on a person lets you do things like import them into your contacts database, or, in the future, other things like email them or phone them. While it is nice to be able to have contact information extracted from the document, it is much nicer to have KOffice know exactly where that information relates in the document. For this I have a new Docker for RDF as seen in the below video. First you see that the addressbook is empty. Then I start moving the cursor around in the document. Notice that the docker picks up when the cursor is on the name of a person that has RDF metadata. You see more information about Frodo, and then I import Sam. The contact entry in the addressbook created for the import brings his phone number in too, which was part of the RDF but not explicitly shown in the document. KOffice starts getting RDF from Ben Martin on Vimeo. I hope to add support for other things like times, locations, and relationships. This way you can send somebody a document describing a meeting and they can import the time into their smart phone directly from the document... can we make retyping such information a vague memory like punch cards? Clawmotia is a remote control for MythTV using Qt and qedje. 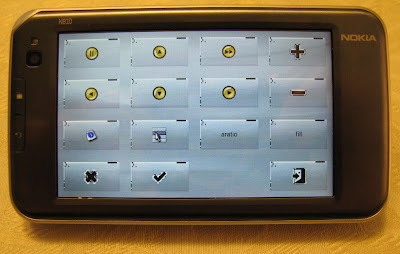 The claw works on maemo and desktop systems. I have updated submenus to fade better, added hotkey support, and improved images and icons since 0.2. Grab it at my maemo repository. In the shot of it running on the device shown below, the euro sign is for commercial skip forward and back. Having the skip back in the top right of the device makes it very easy to hit if an auto skip has gone too far. It is no accident that pause, mute, and cancel are placed in the other corners. The icons below change the volume up and down. In the middle of the top is an icon to bring up a submenu letting you set the aspect ratio and stretch the video in various ways to get maximal use from your screen. Clawmotia is a MythTV remote using edje and Qt. It works well on maemo, desktop and other devices. It requires a MythTV Web setup to talk to. See previous posts for how to set it up. I got rid of the rendering artifacts on maemo, added hotkey support (volume, fullscreen) and some of the buttons on the main remote screen now bring up submenus. 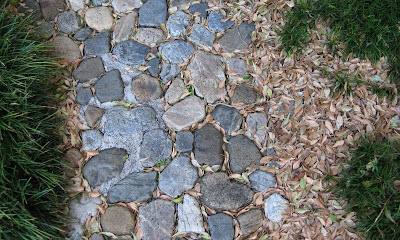 This paves the way for more advanced remote control configurations where intricate but rarely used controls are still available on the remote. For example, aspect ratio and image fill are unlikely to be needed on a well setup MythTV installation, but they are in a submenu of the remote should they be needed. I know the backgound for the submenu panel is not really nice, but with the drop shadow and pan in effect (which also needs tweaking) you can easily see it's a submenu. Grab it here. I've included the x86_64 and armel binaries as well as the edj "edje" file. You'll need QtCore and qedje and you're in business. For the mameo you'll still have to make a menu shortcut yourself, and of course, see the README. Better artwork very welcome. If you have skills, I should be able to take an xcf file and turn out a theme. Conversely, take a look at the edc file and you shouldn't have much trouble adding/removing buttons and changing the images. Recently I started hacking on a memory mapped, multi_index soprano backend. While adding triples, and using listStatements() should work fine, implementing SPARQL is making for interesting times. I started out allowing a single triple match with a filter(regex()) to restrict results. And this worked rather well, making the first one free as they say. So, noticing the little white rabbit that seemed to disappear into the SPARQL bushes, I decided to join in the high tea and mercury sniffing that so induces sanity. Over the course of version 0.0.1 to 0.0.5 the SPARQL code is becoming better, little by little. The code is up at my sf.net page. But don't blame me if the your SPARQL is not implemented yet or your triples somehow disappear. java -cp bin:lib/ssj.jar benchmark.generator.Generator "$@"
Queries are run multiple times to ensure a hot disk cache. This is on a 3 disk RAID-5 and an Intel Q6600 with 8gb RAM. Note that this 0.9seconds is shameful and needs to be optimized back to <0.1sec. So for just listStatements() redland and mmap are fairly equal in performance. Which, for a single indexed lookup, you might expect. In libferris I had restricted RDF usage to raw triple probes like this because I used redland directly prior to version 1.4.x of libferrris. lab -> "yawned excites deflower"
lab -> "goofs excites enigmata"
Gah, and I didn't slip up and put the 3 on the left side of the dot there. We are talking about 0.1 seconds for boostmmap against 3.86 seconds for redland. Since this query doesn't work well on boostmmap it only goes from 1 to 7 seconds. But I think I can resolve it in much much less time than 1 second. This is not meant to make redland look bad, it's SPARQL implementation is much more complete than boostmmap will likely be any time soon. Creating an optimal query plan for the full SPARQL language will be an interesting challenge. Development might be bursty as I don't know what time I can spare for improving the SPARQL completeness in the short term. Clawmotia, an edje MythTV remote control. Sources hot off the presses: clawmotia-0.0.1. You'll also notice the diablo binary for clawmotia on there so you don't need a scratchbox to get going. I put the clawmotia.edj up too so you don't even need to compile that if you don't wanna. Dependencies on the device: Qt, qedje. You probably have most of the requirements for the latter installed if you have canola2 on the device. There are deb files for qedje on its web site. Qt is also packaged for the n810. I don't have debs for clawmotia yet, feel free to send the debian directory to do that. You'll obviously need a MythTV server (and client) to use the remote. It uses the web interface to mythtv so you'll want that installed on the server machine too. The various configuration settings are passed in using environment variables in version 0.0.1. See the script start-clawmotia.sh for these settings. You will also need to be in the same directly as the .edj file when you start clawmotia as it expects that at this point. I install the script, binary and edj into /usr/local/bin on the device. Setting CLAWMOTIA_FS=1 will start clawmotia full screen. There is a bug in version 0.0.1 where it will start but not be shown if started full screen. You have to switch to another app and back to clawmotia to see it. I was planning to fix this before release, but it seems some folks want to have a tinker with it so I'll fix that bug soon. If you want to change the buttons or layout, you only need to edit the clawmotia.edc file. 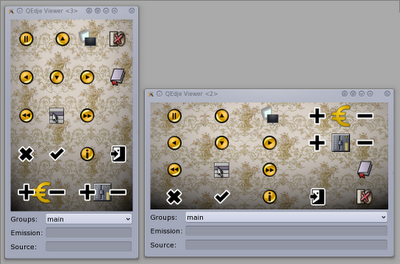 If you are good with the gimp, you might like to reate a theme at 800x480. As long as you use layers it should be a fairly mechanical process to create an edc file for your theme. To make a button, define its image in the images section and call the three macros COMMAND_BUTTON, COMMAND_BUTTON_ICON, and COMMAND_PROGRAMS. COMMAND_BUTTON sets up the area of the screen that will react to your button with an optional text label for the button as arg2. COMMAND_BUTTON_ICON links a COMMAND_BUTTON with an image file. And COMMAND_PROGRAMS links a button with the exact, HTTP encoded string to send to the MythTV server. HTTP encoding doesn't effect single keys much, but Ctrl+w becomes Ctrl%2Bw. The first argument to all the three macros is the button name and should be the same for the same button. Taking a look at what is there and remembering to use all three macros to give (a) initial setup, (b) image file, (c) action should get you one the way. You can update the theme by compiling it with edje_cc and copying it to the device. The application itself shouldn't need any changes. I'll probably move to cmake or autofools at some point. If, on the odd case that there are many patches flowing in, then I'll throw the code into subversion somewhere. The Rasterman has recommended cloning a few hardware remotes as themes. I'm not sure when I'll have the time for that but it should be interesting. Oh yeah, and if you like this then you feel free to contribute toward a memory card or IR transmitter for my future tinkering. Or send any old n900's you have laying around ;) Hey... I can dream right? I noticed that there are many packages which turn a maemo device into a remote control. Unfortunately, the MythTV ones I saw either didn't install or were not what I was looking for. Thus clawmotia was born yesterday. 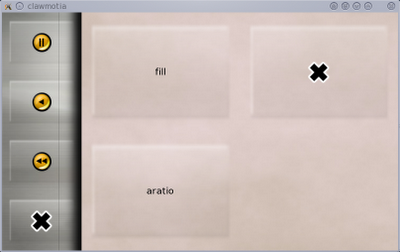 I'm using edje for the interface and qedje to actually create the UI. The program logic uses Qt to talk to a MythTV server and send the commands to it. This relies on knowing there your server is, and what client you want to control which are both passed in as environment variables. Really simple stuff, but it works well. You'll need the Web interface on the MythTV server machine too. The upshot is that you only need a wifi connection and you can control any MythTV client you want. No bluetooth or IR dongles needed. As you can see, there are some nasty graphical artifacts on the buttons which I'm not sure if its the evas engine or something to do with qedje. The black parts on the buttons are not there on the desktop. As it uses edje, you can create different themes and layouts, compile the edje on your desktop machine and just scp it to the device to change the layout and button functionality. 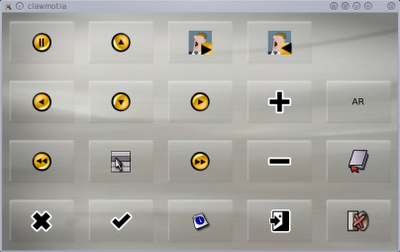 Including cute little slide in and out panels for the more rarely used controls. Hopefully I can convince somebody with more artistic ability than me to do just that. Source will be released in the next few days. 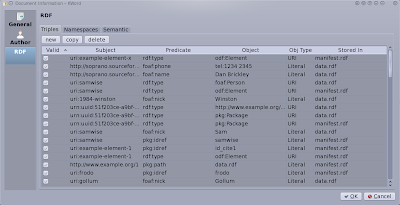 I've started work on a memory mapped soprano RDF backend. Given that mobile devices use flash for their permanent storage, an RDF backend designed using primary storage algorithms should work well on maemo. While the SPARQL implementation is "far from complete", it can already evaluate some common queries very very quickly. I have some triple matching and the ability to have multiple regex filter statements. Other filters and more complete SPARQL lanugage support should follow in time, as time permits... patches accepted etc and so on. For those interested, see soprano-boostmmapbackend on my main sf.net page. If you want to store metadata in a filesystem, there are Extended Attributes (EA). The kernel interface allows you to store key=value metadata in these EAs for each file on your filesystem. The catch is that kernel EA are limited in size, sometimes performance is poor, and some systems do not support EA either natively or in the kernels that Linux distributions ship. The classic example of the latter is NFS, which can have EA support patched in, but many distros do not do that. In libferris the EA interface is virtualized along with the filesystem. So if you are using XFS (or ext3/4 with the right options) then libferris will let you read and write EA to the kernel filesystem. For other filesystems, libferris stores the EA behind the scenes in RDF for you. The difference is no seen by applications, its all just EA... magically every filesystem supports read/write EA. As you can see, backing is where the filesystem is and fs is where you can access backing through libferris. You could just as easily use a HTTP server or emacs as your backing filesystem, anything that libferris can see is up for grabs. The below uses the attr command to set and get and Extended Attribute. Assuming that the /tmp kernel filesystem does not allow EA to be set by users. If in doubt, use an NFS directory and you'll almost certainly not be able to attr -s directly on the backing filesystem. I have changed the URIs to use prefixes in the grep output... as you would expect, there is data attached to the df1.txt URL. $ grep RDFTE t ferris:uuid ferris:93f22bd8-b8be-11de-8e06-001bfc4f043c . That UUID node has an mtime and a out-of-band-ea bnode. And the bnode has the EA foo=bar set on it. As you see, the UUID node has a mtime assoicated with it, this way libferris can tell if you have updated any RDF values for a file, and it becomes like an additional ctime check available to libferris and used for example when indexing files. The gain of having the UUID node use a bnode is that many files can share the same RDF metadata. This is useful if you can access the same file from multiple paths or if files get moved on file servers and you want to relink the old RDF metadata to the file with the new path. I mention file servers here because libferris will track the metadata for you if you use ferrismv/ferriscp, but if somebody moves a file on the file server you've got to have a way to tell libferris about that change. Fileserver movements are a common enough thing that libferris can automatically relink RDF nodes for you. There are also smushing tools available to help with the task. But that's a story for another post. In the early days there was prelink as part of maemo. It disappeared in the n810 distribution ranges. I noticed that there is no armel deb in debian for prelink, but there were murmurs of folks hacking it to work. Push finally came to shove, and as I like C++ many of my apps on maemo have quite a few symbols that need to be resolved before the app can run. The long story short, prelink_0.0.20090311 is up at my repo. Use at your own risk, if your device breaks you get to keep both pieces etc etc. Initial benchmarking: for an app that uses a few libraries, is C++, and has quite a few symbols that the dynamic linker has to attend to. For a complete run before it was 5.2 seconds on a warm start, with prelink of the binary it is 2.5 seconds. Considering that in that 2.5 the app itself has to completely run, there was a huge amount of time spent, err wasted, in the dynamic linker. Of course, if I can get hidden symbols to work too then that 2.5 might drop back to 1.5-2 seconds. But for hidden symbols you have to either wrap things in pragmas or declare each function and class as exposed or not, so for a large library its quite intrusive. But the prelink is a huge gain for no code changes, so far at least. YMMV. It's a touch ironic that Nokia recommends using prelink for embedded devices. But that is for qtopia... maybe for the next distro prelink will reappear in the default installation. 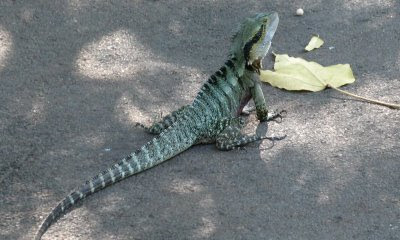 with the image(s) you want to see. Its a fairly quick way to show the movements of the day on a map. I should also add timeline support there I guess, so you can retrace a trip in the order it occurred using just waypoint image files. This also works with any type of file that is location tagged with libferris. If you have a digital long/lat then you can view it on a map (TM). One interesting possibility is using the n810 to shuttle images from a digital camera to the net. This gets around the vendor lock-in that might be present on your camera because the n810 just grabs the images from the cam and then shuttles them onward to wherever. I also updated libferris to allow you to authenticate from the console, just the ticket to let you set things up over ssh with your desktop browser. OK, for maemo, check the repository and you'll want ferris, libferris, and libferrisui at least. Version 1.3.6. If you get into dependency trouble, see the build order to get an idea of the tree. Sorry its a bit hard to get on the device, hopefully stuff will move into extras in time. Anyone who has used desktop flickr tools, you'll know about the whole authenticate before you buy thing. The below commands setup 23hq and copy an image over to it. Hopefully things will become easier in the future: installation, setup etc. Of course, streaming from the webcam to youtube will rock, but baby steps as they say. It always stuck me as a little odd that you have specific applications to upload to flickr, another little app with a cute interface for throwing video files at webserviceY etc. I should also mention that all of this is coming to the maemo build shortly... what better place to unlock web services than a tablet or phone, neh? What ever happened to the unix philosophy, "everything is a file". Then you could just "cp" to flickr, write your facebook status in bash or C-x C-s your mood to facebook://status. I added some support for the flickr API to ferris last year, and the recent 1.3.5 release expands that and adds more web service goodness. But, which of these nasty, closed source services should be supported? The answer: it doesn't matter, there just filesystems! Of course, I'd prefer to mount a FOSS, GNU, Free, Privacy respecting server, and who wouldn't.. but for some things you want to just cp to youtube and forget about it. For facebook I have three objects at facebook:// level. A status file which is read/write, a recent directory which shows the feed of stuff your chums are up to, and a contacts directory with virtual vcard files for your pals. I even added in the profile picture of each friend into their v-vcard. Unfortunately facebook doesn't allow you to get phone number info through the web API, which is strange because you can just simulate a login and swipe it by screen scraping, but that's nasty T&C violating thinking neh? The flickr API mounting should work, to some extent with any service offering that API. For example, 23hq offers free hosting which might appeal. The extensions in libferris 1.3.5 let you see your contacts in a directory, find images by photo ID, browse your photosets and images not yet in a photoset. If you look in your contacts directory, you'll see their photostream and favs as directories. Finally, the mounting of Google docs and spreadsheets. This also has support for appending to plain text files, so you can redirect stdout to append to a google docs text file just as you can >> /tmp/foo.txt. And there are vimeo, youtube and others still needing mounting... but thats what 1.3.6 exists for right? Feel free to send in patches for your fav service! See plugins/context/facebook et al in the source. So I finally updated my Amarok mounting to work with 2.x. I'm still having a few issues with the 2.x of 'rok but that's another story. One of the cool things about being able to mount things with libferris is that everything above ferris can also see them, XQuery, SQLite etc. For example, the amarok://playlist URL shows, as you would imagine, the playlist as it currently appears in the running amarok application. And for a particular album, the playlist and average track time. So, the next release of libferris will include support for mounting google spreadsheets. This works right through to the file manager now. You can mount a spreadsheet as a filesystem and edit it with ego. Changes to cell a written to google, any formulas that are updated appear in the file manager right away, and of course if you are viewing the worksheet in a web browser its updated too. A good rant every now and then? I have been upgrading my Fedora machines by hand using yum. This seemed to work OK, for a machine with minimal tweaking there usually were not so many dependency issues that had to be solved by hand. Though it still is a time consuming process for a handful of machines. So, I recently found out that I'm bad boy (oooh yeah! ), and should have been using preupgrade. Looking at TFM I thought, "fair enough, upgrading a non live system seems like a wise thing". So I gave it a whirl. Which ended up in a strange exception in anaconda and after reboot /var/lib/rpm was missing. yay. So I trip to the reinstall Fedora 11 from DVD shops later and I was back in the mix. But there were/are still some other machines that needed updating to 11. Luckily the second time I didn't loose any data. For one thing, my /var/lib/rpm shouldn't be deleted assumption from before the first install was missing and everything was backed up (twice, I had running incremental baculas too). But preupgrade won't touch a system where /boot is on a RAID. So the second attempt stopped nice and fast. I might try preupgrade again on the laptop next time. I left things fairly stock during the Fedora 11 install there just so preupgrade could possibly work its magic in the future. But I'm wondering if the pain of yum updating across versions makes sticking with Fedora worthwhile. I have better things to do than manually update and tweak things and if other distros don't chomp days of my life every 6-12 months then maybe I should check them out. It's a bit sad that /boot on a software RAID-1 is such a rare setup that its not supported. And that concludes this rant... was it as good for ya? So, long story short, the place I was hosting my maemo repository was on a host at the university I did my PhD at. The server has been suffering unpredictable hardware issues so I have now moved the repository. There is a new subdomain fuuko.libferris.com where I'll be putting up some libferris related stuff, including packages. In particular, the new libferris maemo repository is now up. Also note that I have binary rpm files for Fedora 10 in both 32 and 64 bit at OBS. So, boost 1.34.1 was released back in July 2007. It is however still the current boost shipped with Fedora 10. This is extremely unfortunate as there are many cool advancements in boost over the nearly 2 years since 1.34x. At least rawhide has 1.37, even though 1.38 has been released for over a month. Looks like I'll have to add another switch to libferris configure.ac to drop some features to be able to compile against old boosts. めんどうくさい! Normally I refrain from criticising other projects that are "competing" with my little hobby -- libferris. I mention competing in quotes because hobbies don't really compete in a commercial sense. But having read this post recently on planet maemo about Tracker progress I was a little overwhelmed, wondering, was the Tracker code really so bad a year ago? "In this last year, we refactor (well, almost rewrote) the daemon"
Most of the index engine implementations in libferris will detect when you try to add the same file again, and when it hasn't changed in a meaningful way will just skip reindexing it. This makes it really easy to just use the below command to update the index for a specific filesystem. 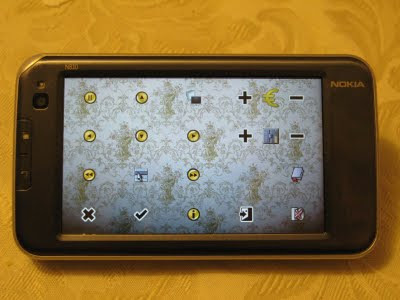 The trick comes in when /Data is an NFS share with 400,000 files on it that you are accessing from a Nokia n810. Or when /Data is a file server that you are indexing from your laptop over wifi or another sluggish, higher latency network. feaindexadd can be told to directly traverse one or more directories and so you don't have to use find in the above command. But separating out the find from the indexing has a really big advantage: you can update indexes of extremely large, but infrequently changing NFS shares very quickly -- Even over slow networks. Of course, this relies on /Data being the same filesystem on both the server and the client. Otherwise you're in for some fun with sed or awk to mangle the paths to be what the client expects. And the 10 in the above means that you'll have to run the command from cron within 10 days to maintain a complete index. You might find that doing a "time find /Data" on the client and server has significant performance differences, particularly if the filesystem has many files. You can always store and search the index from the file server, but for disconnected searching, you really need to have the index itself stored on the maemo device. In a previous post I had a video showing one of the libferris inverted file metadata index plugins on maemo. Unfortunately that implementation was designed for a desktop machine, meaning for many many more files, slow disk head seeks, blazingly fast CPU(s). While these videos are not as snazzy as some others, I make them so folks can get an idea of the real performance of the software. Saying its "acceptably fast" or takes less than a second is all well and good, but seeing the snail or rabbit move gives an immediate gut feeling if its "fast enough". The new maemo custom designed metadata architecture uses the mmap() design. I always have my reservations about mmap() because it encourages data structure and algo choices that are directed at an in-memory world. That is all great if you can cache the entire memory mapped file in main memory, but often leads to kittens crying when there isn't enough RAM for that. For maemo with 128mb total RAM this is also an issue, but with the much faster disk seeks of flash storage the relatively poor data clustering of mmap()ed designs is a bit less important for performance. But of course, data clustering and physical layout is always interesting when playing the indexing game. Shown in the video above is a search using the new "custom mobile device" libferris metadata index. As I continue to type a regular expression to match against the URL, libferris gives some search results on each character entered. Note that this is against an index with over 10,000 URLs in it. This index format will be available in libferris 1.2.7+. The index format sports a probabilistic regular expression prefilter for URL matching. This means that the results of the prefilter might include some false positives, but anything the filter drops out is definitely not a match. You have to run the regex itself on all results of the prefilter to drop out the false positives. The prefilter can drop the number of times a regular expression is evaluated down to less than 100 in 10,000 URLs given only a 3-4 character regex. This helps out oodles when you want to run raw regex searches on big (for a portable device) indexes and you want your results asap. An unfortunate current side effect of the mmap() design is that the index is architecture dependant. Mainly because some secondary offset-pointer information is 64 or 32 bit width dependant, so its a matter of tracking those peskies down and clamping them to a fixed width. To get around that for now, I indexed the 10,000 odd audio files over NFS from an n810. Some information for those looking to play, if you are using boost to memory map, you may well discover that atomic_cas32() calls __sync_val_compare_and_swap() which is not actually available on the maemo device (for me). This is with a modified scratchbox using gcc version 4.2.1. I'm not sure if there is an accepted cas et al library for maemo/armel. I leave the hacks for __sync_val_compare_and_swap() to the reader and their accepted level of concurrency control risk. Of course, if a unit comes out with an embedded accelerometer in it then using a "slightly clunky" wiimote will no longer be needed as the source of motion data. I recently added the ability for libsixdof to control closed source applications as well as properly patched open source ones. This was mainly to let Google Earth finally take some advantage of proper sixdof devices, but it works equally well for Canola2 on maemo. Controlling Canola2 using libsixdof and a wiimote from Ben Martin on Vimeo. Two big features that libsixdof brings is the ability to configure what happens when the controller is moved on an axis, and how frequently that happens. So, if you don't like your images flicking past at 20 images / second in Canola, you can limit it to whatever / second. In the video, having maximum axis movement will only ever scroll 3 images / second. So when I hold the unit causing a continual next image movement I can still see what is happening and Canola2 does not get overloaded with events. Flipping pages in a PDF by moving the n810 from Ben Martin on Vimeo. Again the wiimote is actaully held behind the device. I'm sort of getting the hang of the controlling code etc so that you can use more subtle rotations of the device to issue commands to the running program. This is using the same stuff that the Canola2 video did, I could patch a PDF viewer, but for discrete events like next-page it doesn't really make a huge difference. Panning is the big thing that screams out for patching. 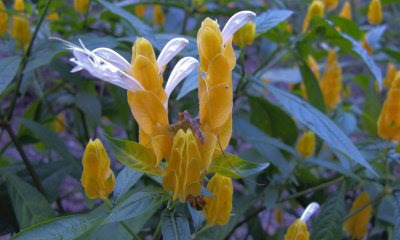 A walk through the botanical gardens the other day with a digital camera and I had a nice little harvest of background images. Unfortunately the initial scale and crop of the scaled creature to 800x480 means his head is hidden somewhat under the status icons. But many of the other more generic ones work well for backgrounds. Plus I get the added bonus of having a collection of prescaled 800x480 images for demoing Canola hacks. Shown below is a video of the forthcoming 0.1.0 release of libsixdof with a wiimote. I have hacked up maemo-mapper to have initial support for libsixdof, I'll have to clean up the patch before letting other human eyes see it's nastyness :| I decided to use the C++ sixdof API which means there is a single C++ source file in my build of maemo mapper, it was just faster to get it coded that way. Perhaps I'll convert to the libsixdofc ANSI C API before sending the patch. Didn't your n810 come with an accelerometer? from Ben Martin on Vimeo. Although libsixdof supports other 6-degrees of freedom controllers too, getting those controllers to work on maemo is a little more of a challenge. For example, I would love to use the portable spacenavigator usb device with maemo. 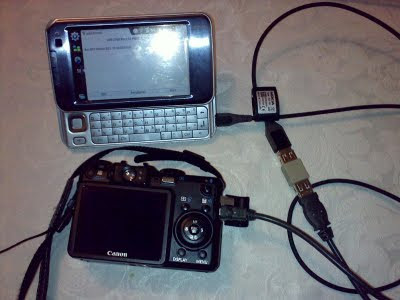 Even though most folks have the USB cabling to hook up the unit, and it gets detected by the n810 when you have USB in the right mode, getting XInput events from evdev on maemo might be another battle. It is not like that part is trivial on a desktop distro either right now unfortunately. I might end up hacking support for direct /dev/input/foo kernel devices into libsixdof to get around that issue and have "real" 6dof devices working under maemo. OK, so now I have relevant posts aggregated onto planet maemo, hi everybody </dr-nick>. My repo also contains a few handy misc packages like unison, sshfs, fuse, and tinc. Anyone notice the hints that I like filesystems? The unison package could be made to have a few less dependencies, but it works well already. I have compiled afuse, obexftp and obexfs for maemo but those are not in my repository yet because I'm having trouble getting the 810 bluetooth to work from the normal obex packages instead of through the osso-gwobex layer. It would be nice to be able to mount a mobile phone's sd card through FUSE on the n810 and share storage a bit more, but I digress. You'll also notice cwiid and libsixdof added recently to the repository. I have been playing with a wiimote on the desktop and on the n810. The libsixdof on the 810 can read the state of the wiimote OK. The wmgui tool locks the CPU of the n810 at 100% when using the accelerometer mode, so clearly you have to be somewhat smarter about what you update for each event on an embedded device. I have hopes that I can hack maemo mapper to use libsixdof soon and thus be able to control it on an n810 using a wiimote ;) Getting other six degree of freedom controllers to work will be more of a problem on maemo because you need to use a very recent evdev with a patch for some devices. One of the issues that still plagues libferris on maemo is the lack of prelinking. Starting an application that uses libferris causes the CPU to spend a bunch of time resolving symbols before it can start executing anything. I've enabled hidden symbols, compiled with a later gcc than the scratchbox normally uses and played games to speed things up, but getting close how quick a desktop machine can resolve symbols at application startup has still escaped me. I might end up rsyncing / to nfs:/foo and running prelink on an n810 just to see if/how much that helps things out. So one is running the Chinook from about Feb 2008 and the other RX-44_DIABLO_5.2008.43-7. I thought that wifi felt faster on Diablo, so I did a little measuring. Its quite slap happy but does show some considerable difference, using the same DLink DIR-855 AP for both devices. The chinook k/s is quite stable at around 350. On diablo things move around quite a bit in terms of speed. 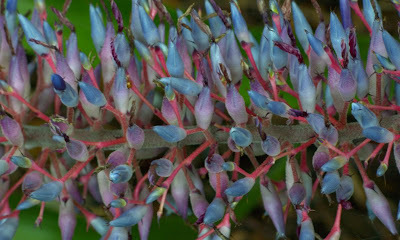 Perhaps this bursty nature works well for browsing making things 'feel' faster too.